In our life, the shape of window is not fixed. There are many windows in abnormal shape, such as arc. It is inconvenient to install curtain. Fortunately, there is curved window track. It makes curtain be installed according to the shape of window. The open and close of curtain is use-friendly. If you are interested in custom-made curtain, then recommend you to read this article. Take the orientation of window into consideration when selecting curtain. South facing window has good lighting condition, chiffon, thin cotton, silk made curtain are recommended. North facing room give people the feeling of dim and cold, warm colored heavy curtain can make it more welcoming. For windows face east or west, sunlight shading is the first element to consider when choosing curtain. Sunlight shading curtain should block the strong sunshine out of room at the same time of providing enough lighting for indoor activity by using natural light. If your bedroom has window near prosperous street, the noise, light from street lamp and advertising board are strong. You need thick curtain to block all those factors that will affect your sleeping out of window. Side hanging curtain is the most common style on market. It is simple designed, have no extra decoration, wide selection in size. You can find it in many houses. Home owners can choose the style of side hanging curtain – one side pulling style or two sides pulling style. Usually 1.5 m is the division reference of it. The connection way of curtain and curtain rod is varied: punching directly on curtain – it is convenient for the move of curtain; hop-pocket way – this connection way has good ornamental value, but the friction force between curtain and rod is large, especially when the size of hop-pocket is similar with the diameter of rod; suspender way – curtain with suspender connection way give people the feeling of simple design, it suit for light curtain; binding type – the flexibility of binding type curtain connection is poor, it is often used on decoration window that use rarely; curtain ring – with this connection way, curtain is easy to move and convenient to replace. Warm colored curtain in living room give people the feeling of hospitality. Curtain for study should be neutral or cold color. This is coordinated with the room function of study. Neutral and cold color make people calm down and can concentrate on work, study or reading. 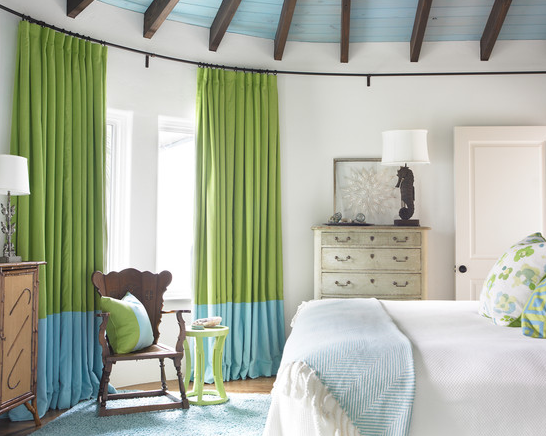 Steady and elegant colored curtain make bedroom quiet and graceful. It is good to sleeping. Yellow and orange colored curtain can whet appetite. White curtain give people clean feeling. They are widely used curtain color for dining room. The above curtain color is the recommend according to the room function. In fact, the color of curtain should also be harmonious with design style. When the color contrast of floor and furniture is strong, home owner should choose curtain color according to floor. On the contrary, when the color contrast of floor and furniture is weak, furniture color goes first. When floor and furniture cannot be looked as reference for curtain color, lighting is the option. Saffron yellow lighting matches well with cold color like beige, apple green. Ivory-white lighting is good partner with warm color like beige, light brown and light red. Measuring the curtain accurately has many benefits: know how many curtain you need; pay more attention to the details of curtain. Metal ruler is recommended. No matter you choose curtain rack or curtain rod to install, the curtain hem should be 15 cm below window sill. The width of curtain extend 15 to 20 cm than window. The width of curtain is decided by curtain rack or rod, not window. If the curtain is two sides pulling style, take overlapping part into consideration. The length of curtain is decided by the curtain hem. If you want to find more useful home decoration articles, please click here to explore more.